This workbook supplements the textbook Learning Elementary Biology for Class 6. In this workbook, thought provoking questions have been framed to cover all the topics that are in the textbook. The sequence of the chapters is same as in the textbook. This will help students in revising and understanding the concept learnt in the text book. Sufficient space, wherever necessary, has been left for drawing diagrams. 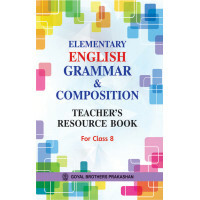 This workbook can also be used by teachers to test whether the students have grasped basic learning objectives and their applications and relation to everyday experience. The space provided for writing answers is sufficient for the facts/ideas asked and the students can develop their answering skills by writing answers within the space provided. Learning Environmental Education Class 6..
Goyals ICSE Chemistry Model Test Papers For Class X..